In January 2017 we were asked to make a hummingbird oval to be given as a gift in June 2017 for the Most Worthy Grand Matron of the Order of The East Star at its Grand Chapter 2017 meeting in Calgary, Alberta. This oval measured approximately 6 inches wide by 8 inches high. This oval ended up going to Florida USA. Grain Elevators are all but gone on the Canadian Prairies, those that remain are being preserved by local historical societies etc. We just made a series of these for a client that gives them away as gifts. The elevators measure approximately 5 inches wide x 7 inches high. 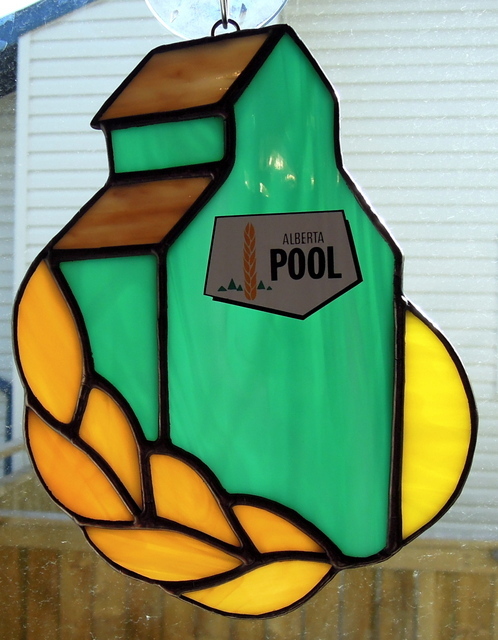 We were fortunate many years ago to obtain Alberta Wheat Pool Stickers. The glass used for the elevator was Spectrums # 823.72 Teal Green. 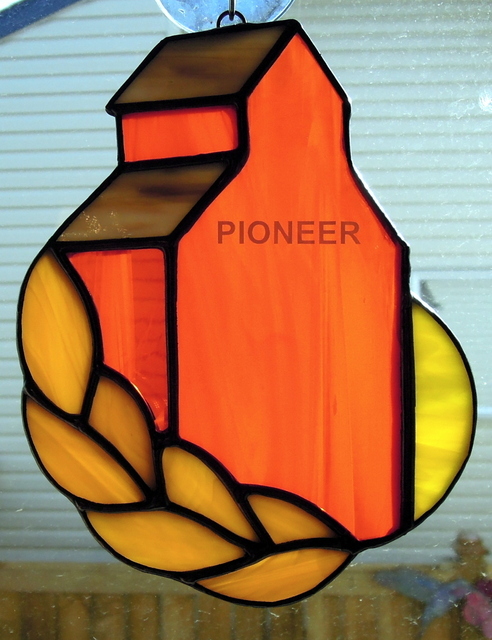 For the Pioneer Elevator the glass used was Spectrum # 379.1S Light Orange and White Wispy. We had the white letter specifically made for the Pioneer Elevator. 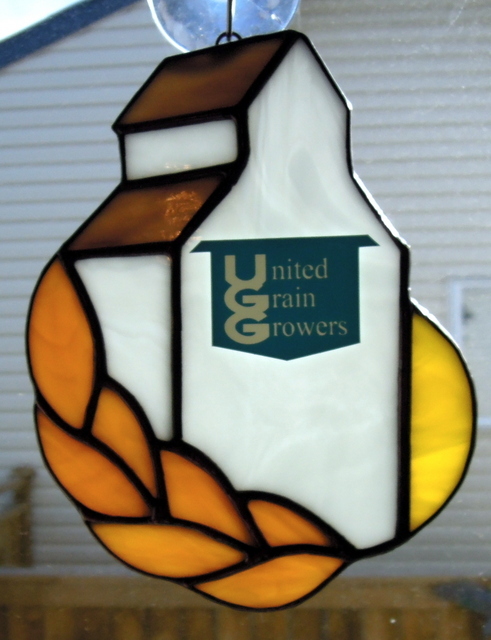 We had the United Grain Grower symbol made and the glass for the Elevator was Spectrum # 307 Clear White Feather White. 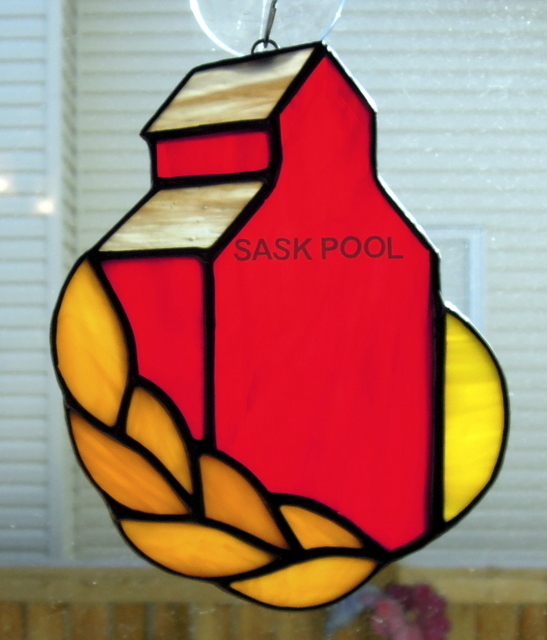 The lettering on the Saskatchewan Pool Elevator is white and the glass used was Spectrum # 359.1 Red & White Wispy. 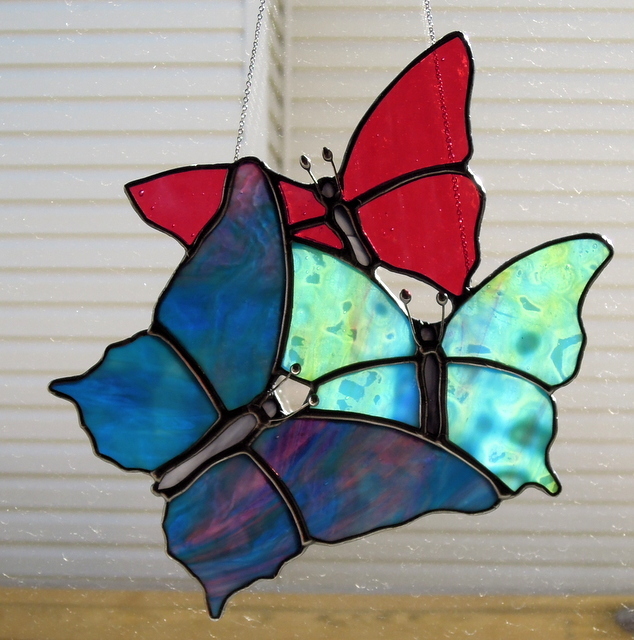 Early this year we made this Butterfly Trio Cluster. 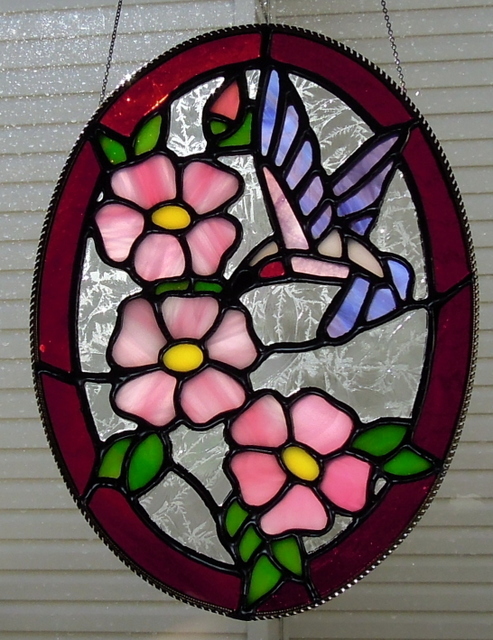 The top red butterfly was made with Bullseye #1311 Crimson Red, for the bottom left we used a Bullseye # 3346-30 Cranberry Pink, Azure Blue, and for the one in the middle a heads & tails piece of Youghiogheny. 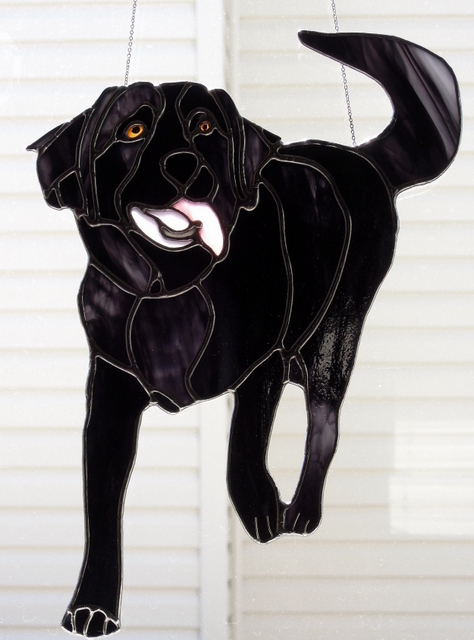 This suncatcher measures approximately 6 inches wide by 8 inches high. Flory required a gift for Alberta’s Worthy Patron of the Order of Eastern Star earlier this year and one of his favourite flowers was the Alberta Rose. 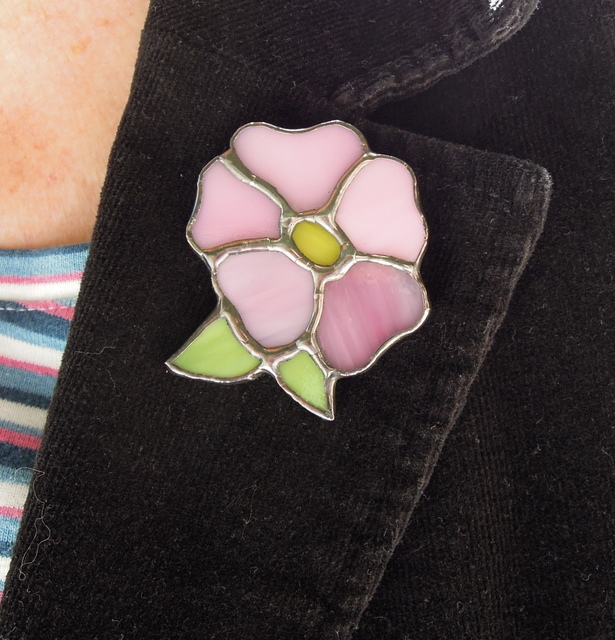 We reduced the size of our Alberta Rose and made it into a lapel pin. We then attached rare earth magnets to the back which are strong enough to hold the rose on lapels and can also be used as a fridge magnet. 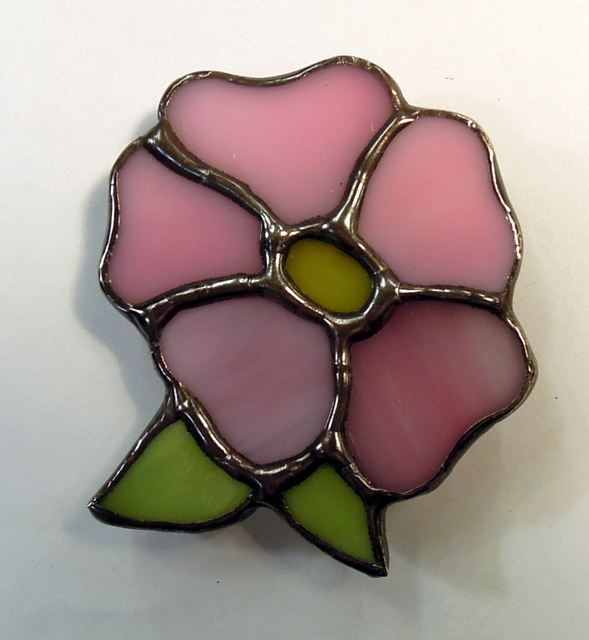 The first photo shows the rose before having black patina and polish applied, and the last photo shows the completed Alberta Rose. For their 2nd Annual BC & Alberta Guide Dogs Trivia Night Fundraiser event which was held on April 29th, 2017 in Calgary, we made this Black Lab. We used Armstrong Glass # AG – 1825S an Opal Black/Streaky which allows light to filter through this glass (most black glass allow no light penetration). The dog measures approximately 8 inches wide by 11 inches high. Once again the fundraiser was very successful to raise funds for the development of dogs to help kids with autism, seeing eye dogs for the blind etc. They are always looking for donations. One can also become a puppy sponsor by accessing their website.